Shared UVs. Create and organize UV islands. Edge selection mode. Select edges in the UV Editor and 3D views. Highlighted shared UV points and UV edges. Highlighted boundary edges on the 3D model. Highlighted seams in the UV Editor. Peel UVs for unfolding pipes, tubes, paths and roads. Orient/align UV islands. Automatically align UV islands. Stitch/sew UV islands. Sew together discontinuous UVs. AutoScale UV islands. Automatically scales UVs proportionally. UV Pinning. UVs can be pinned for tools such as LSCM UVs. Seam Marking. Vertex edges can be marked for easy cutting. ABF UVs uses angle-based flattening for reducing texture stretch. Display UV texture distortion and UV winding order. Interactive seam picking mode. For marking seams in the 3D views. 3D Gizmo selection axis for manipulating geometry. Dramatic increase in UV and vertex welding speed. Poly reduction tool for reducing polygons while preserving detail. Repainting UVs for creating texture atlases from multiple textures. Import/export lights. More compatibility between file formats. Light Editor. For editing the properties of lights. Runs under Windows XP/Vista/7/8/10 platforms (64-bit). 64-bit allows access to more than 4GB of system memory. Easy to use UV mapping editor. Fully OpenGL rendered viewports, with multiple layouts. Standard planar, box, cylindrical, and spherical UV mapping. Unfold UVs for unfolding faces into a 2D pattern. Pelt mapping for unwrapping organic models. LSCM UVs for reducing texture stretch. Stretch UVs for spreading out overlapping faces. Relax UVs to help minimize texture distortion. Pack UVs onto one texture to improve cache performance. Untangle UVs to separate overlapping UV coordinates. Interactive camera, planar, cylindrical, and spherical UV mapping. mirroring, straightening, stitching, and welding of UVs. flipping, welding, unwelding of vertices and faces. Material editor for editing material and texture properties. Bone editor for editing bone and animation properties. Export UV maps as Photoshop vector layers. Export UV maps to high resolution bitmaps. UV maps get updated in real-time. Pan and zoom in UV mapping space. Paint in 3D using vertex colors. Fast lasso and rectangle selection tools. Select by vertex, face, group, or material. Auto update of textures from file. Auto detection of texture aspect ratio. 99 level undo system by number or storage. Subdivide UV coordinates and geometry. Plugins that allow unlimited 3D import/export functionality. Import textures in variety of 2D graphics formats. pyramid, prism, tube, torus, capsule and text primitives. Runs under Windows XP/Vista/7/8/10 platforms. View a complete list of currently available file formats. 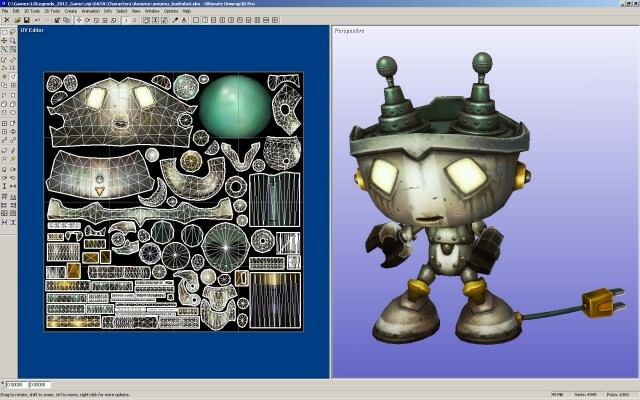 A video demonstration of the Sew UVs tool can be found here. Legal & Privacy Copyright © 2019. All Rights Reserved.